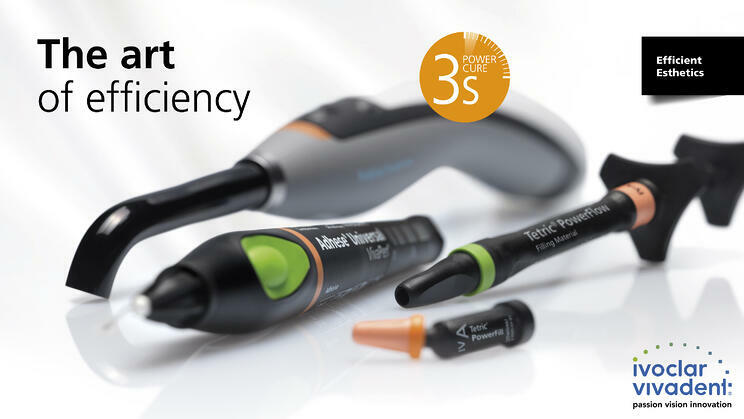 3s PowerCure offers coordinated products for the fabrication of long-lasting composite restorations in the posterior region of the permanent dentition (Class I and II). The following components form part of this system: the single component Adhese Universal, the mouldable Tetric PowerFill and the flowable Tetric PowerFlow 4-mm composites, and the intelligent Bluephase PowerCure curing light, which cures the above components in 3s. The 3s PowerCure product system enhances the efficiency with which high-quality esthetic posterior restorations can be achieved. Read the results of numerous in-vitro and in-vivo studies in the scientific documentation. Convince yourself. * Tetric PowerFill and Tetric PowerFlow compared to Tetric EvoCeram and Tetric EvoFlow; data available upon request.